Samsung is showing off a new Connect Home smart home hub and app for managing all your smart bulbs, gadgets and appliances at its Unpacked event for the Galaxy S8. Sure, voice control is super trendy at the moment, but Samsung seems to be focusing on the fact that no-one has really nailed the smart home hub app yet. The likes of Apple and Nest are getting there but there's still room for Samsung as it makes well, everything. Samsung Connect was announced alongside the new Gear 360 (2017), Samsung VR, Galaxy S8 smartphone and a new Gear VR finish. As well as managing Internet of Things devices via the cloud, Samsung Connect will also help you to set up new bits of tech via a three-step configuration process. 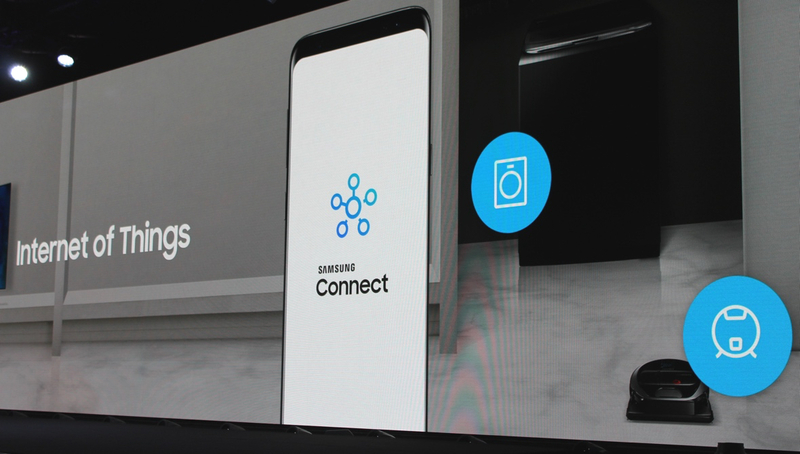 As well as Samsung's 2017 gadgets, Connect also works with the new Connect Home router (which is also a SmartThings hub) and compatible devices such as Philips Hue smart bulbs, Ring video doorbell and Netgear's Arlo camera. Plus a Samsung rep added: "we will soon be able to expand it to many more devices in the future." We got a few demos of Connect in action. It's nothing mindblowingly new, but it does take some of the pain out of smart home controls and automation. So you can use Connect with Samsung's latest SmartHub fridge to see the contents inside via a camera, when you're out and about. You can set Places in the app, like Home and Office, and assign devices to those locations but still be able to control them from the same app. There's also different modes over different synchronised devices. So one button when you leave for the day switches everything off - such as all your smart bulbs - and also signal to a Samsung robot vac to get to work. Nifty. Stay tuned for more details on a full list of which devices will be compatible and when Samsung Connect Home (and the Pro version) will be available.